I was fortunate to grow up in a time when 4-H and Girls Scouts were "in." Maybe it wasn't the time, but the place . . . are kids still participating in these clubs down in the states? 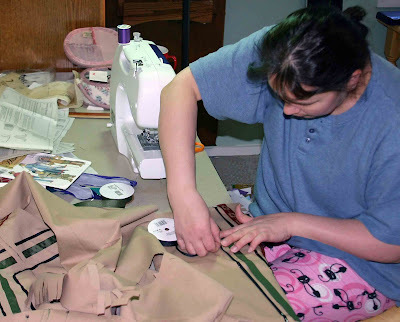 I know that they are popular in the small towns of Alaska, and I owe much to both groups for teaching me many skills—especially the fundamentals of sewing. They've come in handy lately. Every third grader at my 8-year-old's school was assigned an historical figure to research and write a paper about. They all then worked together to create a "Wax Museum," by dressing up as their heroes and posing in front of small sets they had created. My daughter was Pocahontas. 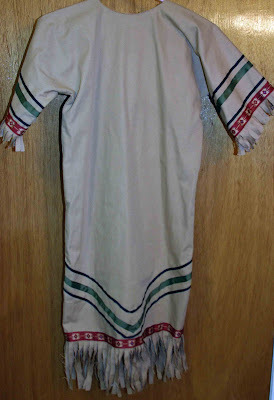 Have you seen the prices of ready-made Native American costumes lately? Factor in the shipping costs to the Last Frontier, and you're talking a small fortune to dress your child for a school activity. I figured I could save a few bucks and make the outfit myself. Some cooks are messy in the kitchen, and some cooks clean up as they go. Take a look at my sewing table and then try to guess which kind of cook I am. The design was quite simple, but required a meticulous eye for lining everything up. The only reason you're not looking at a bunch of squiggles and butchered fabric is because my mom, the überseamstress, stepped in and removed the marking wheel from my hand before I could cause any lasting damage. She marked all the lines for me, cut the fringe, and then hid any and all sewing implements from me so that I couldn't "touch up" anything. If the Pocahontas dress wasn't enough, my eldest daughter had to go and try out for a play in which she was cast as a princess. 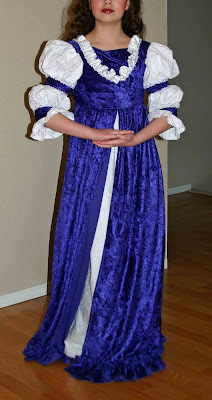 I found tons of princess dresses online, but they were either super cheap looking (really bad nylon-type fabric) or $100 each. Yikes! Nothing in the dress-up closet fits her any more, so I headed to the fabric store, bought a pattern, and found some material on sale. This was the most complicated article of clothing I have ever sewn, but I can honestly say that I did most of the work myself. My mom did save my bacon, though, by making the ruffle on the bottom and helping me with that pesky insert? inlay? (the piece that provides modesty) at the neckline. I am really impressed!! What a great skill to have especially when you really need it! Both costumes turned out beautifully! I admire people who can do either of these things or both. They take patience, practice and and an eye for detail. Great job! Wow, Kim, I'm impressed!! There's no way I'd be able to do something like that and I'm dreading it because I know at some point my kids will need some kind of costume and I'll have no clue how to make it!